3 Foreign currency swap A currency swap is often the low-cost way of obtaining a liability in a currency in which a firm has difficulty borrowing. A pair of firms simply borrow in currencies they have relative advantage borrowing in, and then trade the obligations of their respective loans, thereby effectively borrowing in their desired currency. A “Plain Vanilla” Foreign Currency Swap is when two firms trade fixed-rate interest payments across currencies. Swaps only exist because there are market imperfections. If firms can access foreign and domestic debt markets at equal cost, clearly swaps are redundant. 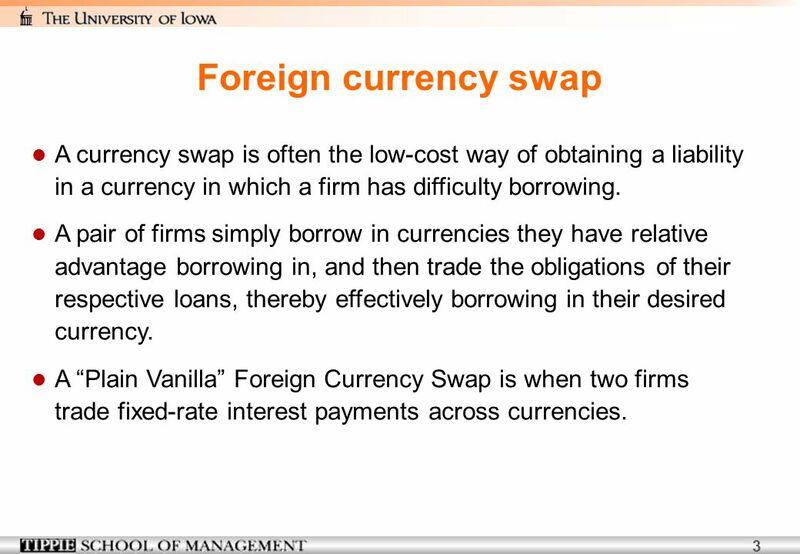 One important reason that currency swaps are so useful is that firms engaged in a swap need not each have an absolute borrowing advantage in the currency in which they borrow vis-a-vis the counterparty. 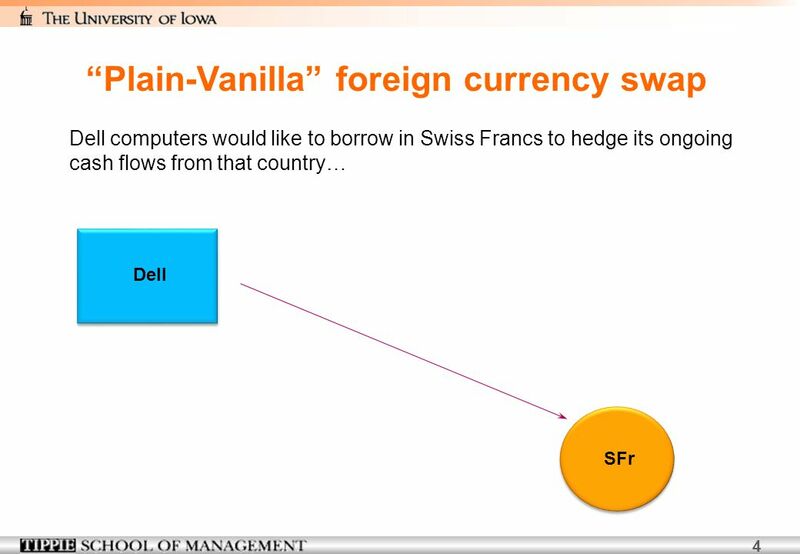 In fact, it is quite likely that Nestle has better access to both the U.S. and Swiss debt markets than Dell. Nonetheless, a swap may be mutually advantageous. 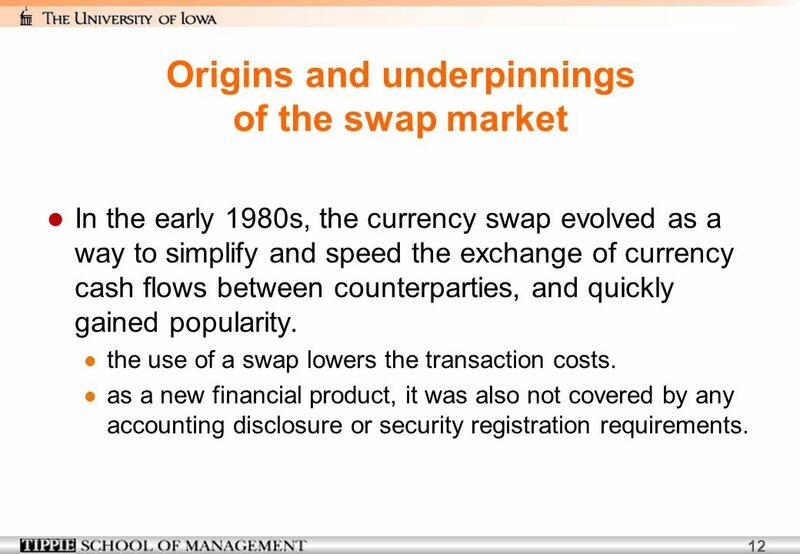 In the early 1980s, the currency swap evolved as a way to simplify and speed the exchange of currency cash flows between counterparties, and quickly gained popularity. 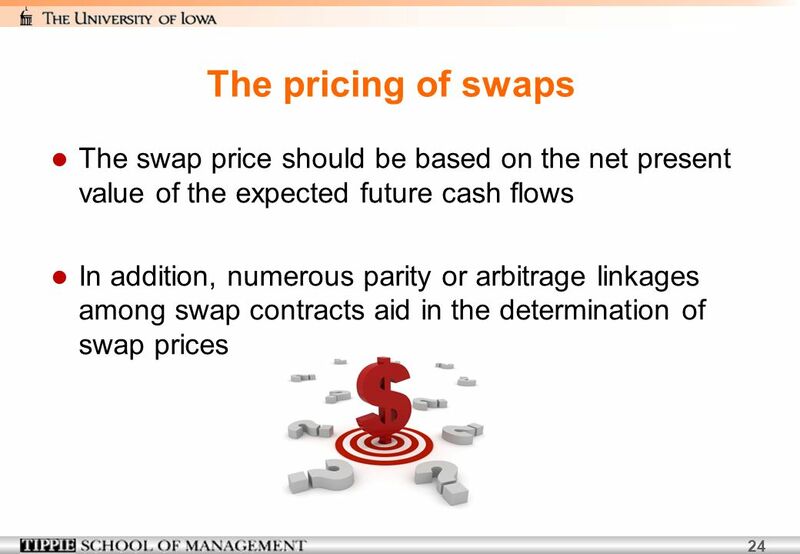 the use of a swap lowers the transaction costs. as a new financial product, it was also not covered by any accounting disclosure or security registration requirements. 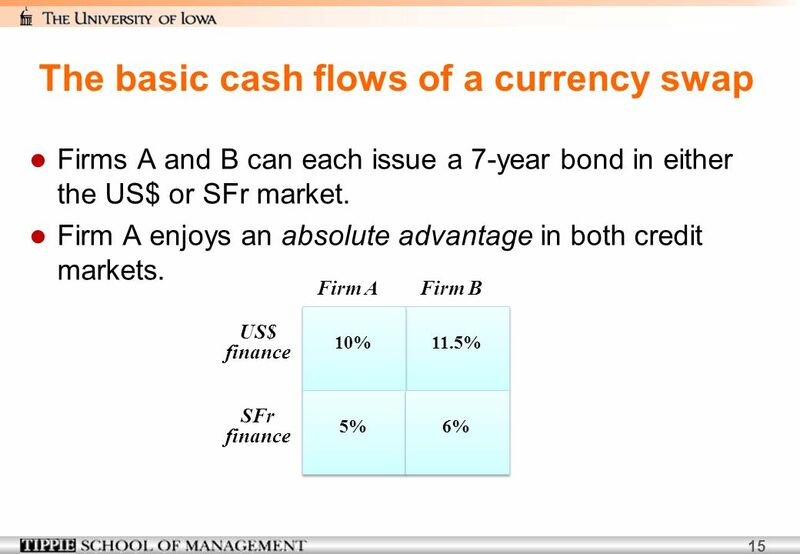 Firm A has a comparative advantage in borrowing US$, while firm B has a comparative advantage in borrowing SFr. 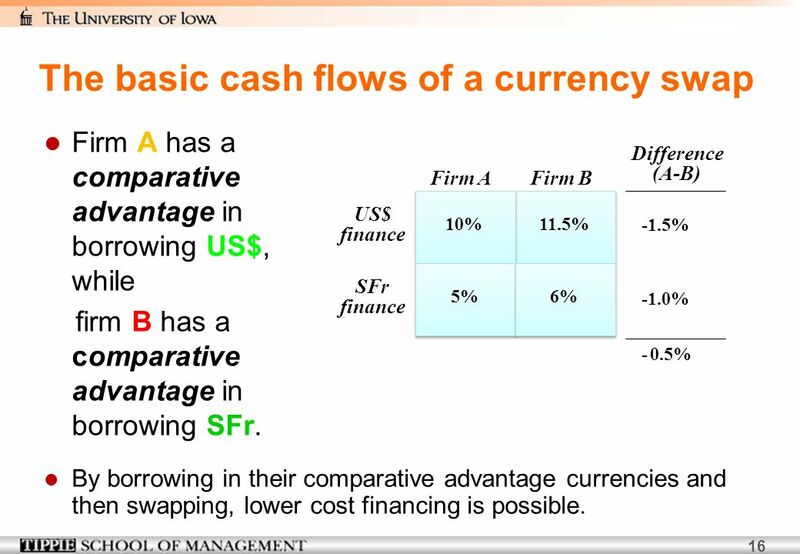 Difference (A-B) -1.5% -1.0% - 0.5% 11.5% 10% 5% 6% Firm A Firm B US$ finance SFr By borrowing in their comparative advantage currencies and then swapping, lower cost financing is possible. $ at t 0 SFr at t 0 10.75% (US$) [t 1 - t 7] 5.5% (SFr) [t 1 - t 7] A Borrows $ at 10% for 7 years B Borrows SFr at 6% $ at t 7 SFr at t 7 Together, A and B save 0.5%. Note that if a bank or swap dealer intermediates the transaction and charges a fee, the aggregate interest savings will be reduced. 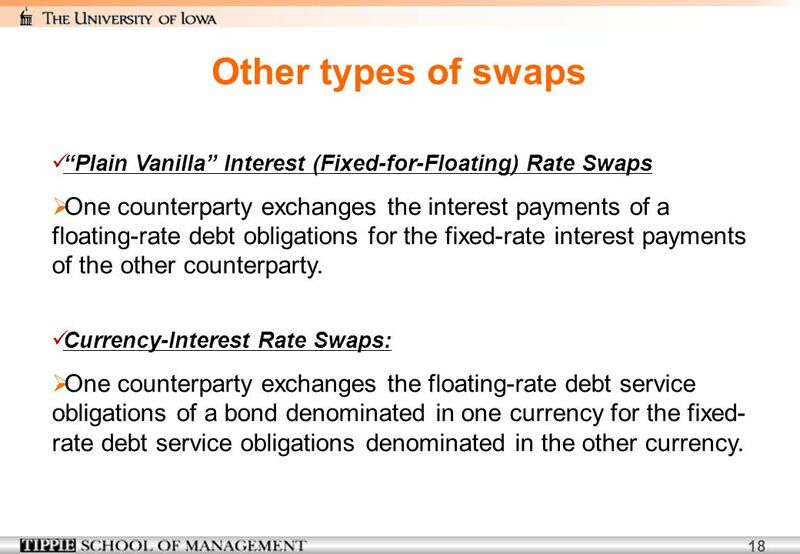 18 Other types of swaps “Plain Vanilla” Interest (Fixed-for-Floating) Rate Swaps One counterparty exchanges the interest payments of a floating-rate debt obligations for the fixed-rate interest payments of the other counterparty. 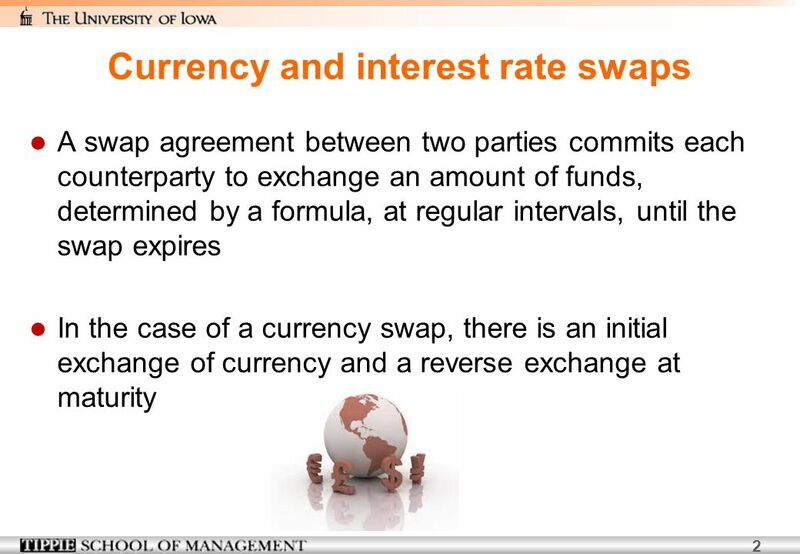 Currency-Interest Rate Swaps: One counterparty exchanges the floating-rate debt service obligations of a bond denominated in one currency for the fixed-rate debt service obligations denominated in the other currency. Firm A has a comparative advantage in the fixed-rate bond market, while firm B has a comparative advantage in the floating-rate bond market. 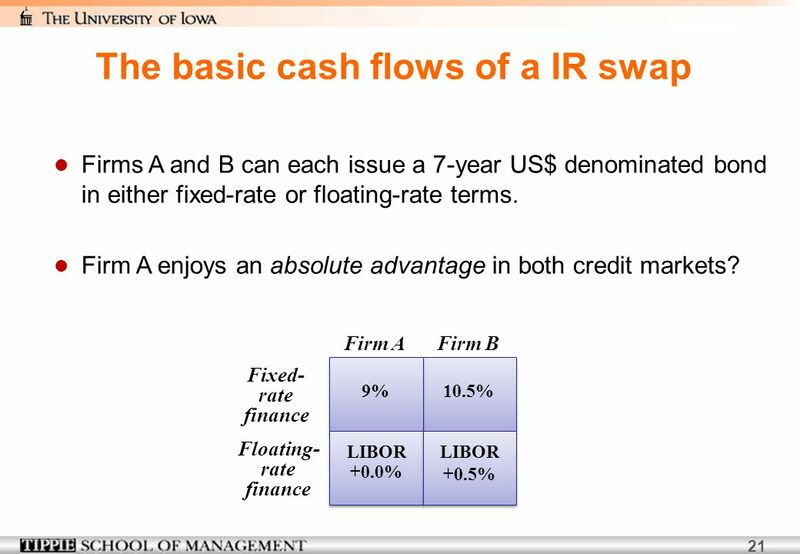 Difference (A-B) -1.5% - 0.5% - 1.0% 10.5% 9% LIBOR +0.0% +0.5% Firm A Firm B Fixed- rate finance Floating- By borrowing in their comparative advantage markets and then swapping, lower cost financing is possible. 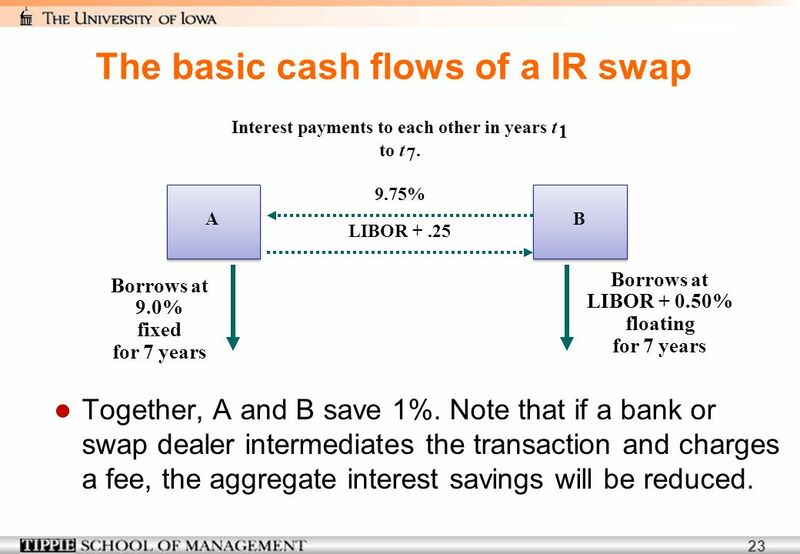 9.75% LIBOR + .25 Interest payments to each other in years t 1 to t 7. A B Borrows at 9.0% fixed for 7 years LIBOR % floating Together, A and B save 1%. 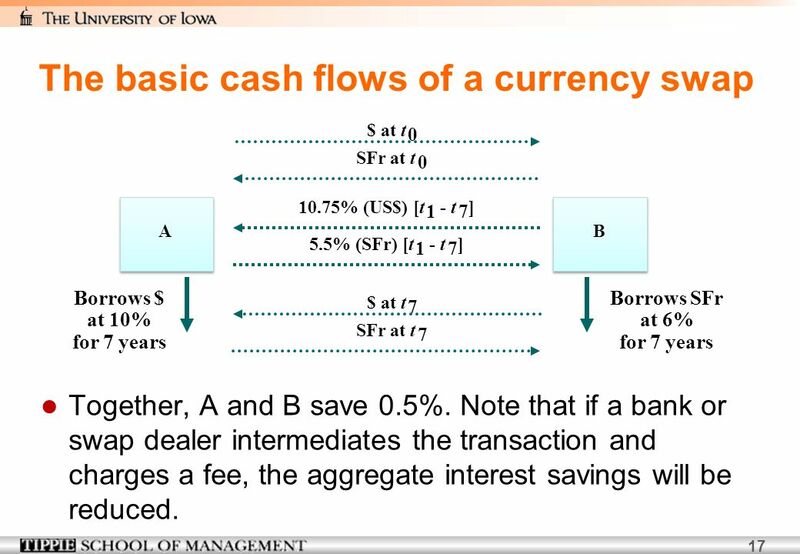 Note that if a bank or swap dealer intermediates the transaction and charges a fee, the aggregate interest savings will be reduced. 25 The pricing of swaps Currency X Currency Y Fixed Rate Asset or Liability Floating Rate Interest Rate Base Currency of Denomination Two currencies, X and Y, have both fixed-rate and floating-rate segments. 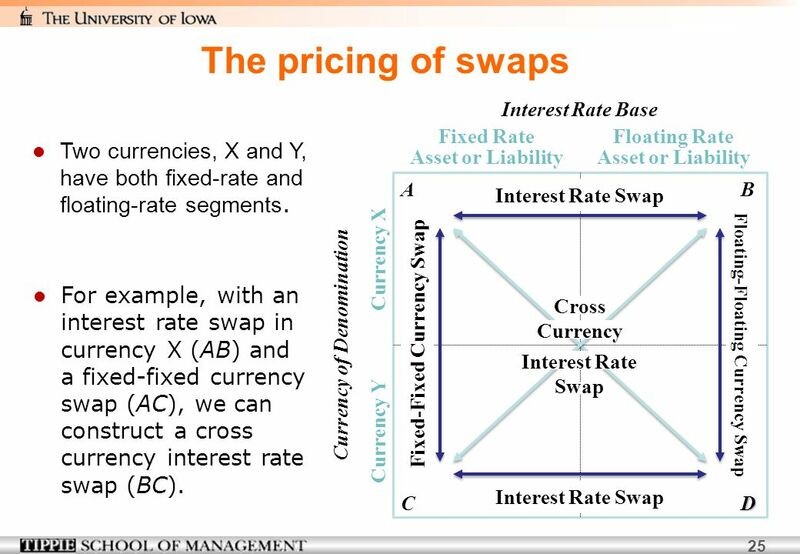 Fixed-Fixed Currency Swap A Interest Rate Swap B C Cross Currency Interest Rate Swap Interest Rate Swap Floating-Floating Currency Swap D For example, with an interest rate swap in currency X (AB) and a fixed-fixed currency swap (AC), we can construct a cross currency interest rate swap (BC). 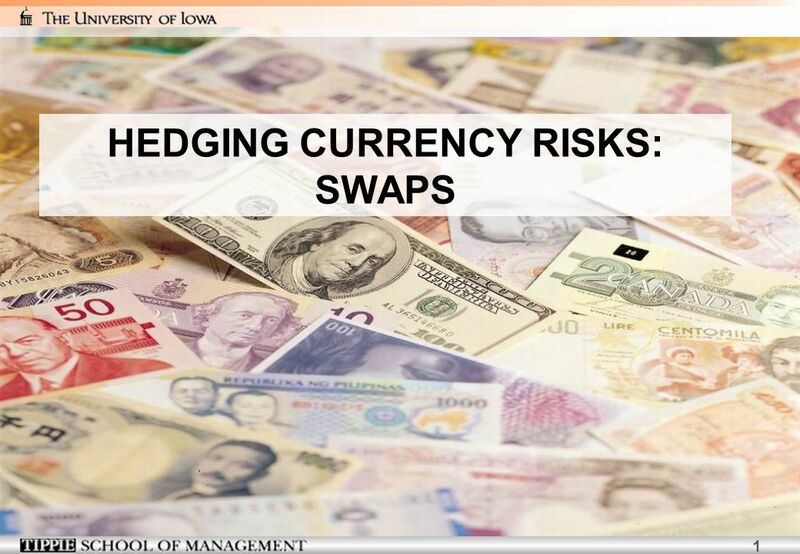 Download ppt "HEDGING CURRENCY RISKS: SWAPS"
1 CHAPTER 15 Interest Rate Derivative Markets. 2 CHAPTER 15 OVERVIEW This chapter will: A. Describe the plain vanilla interest rate swaps B. Explain the. 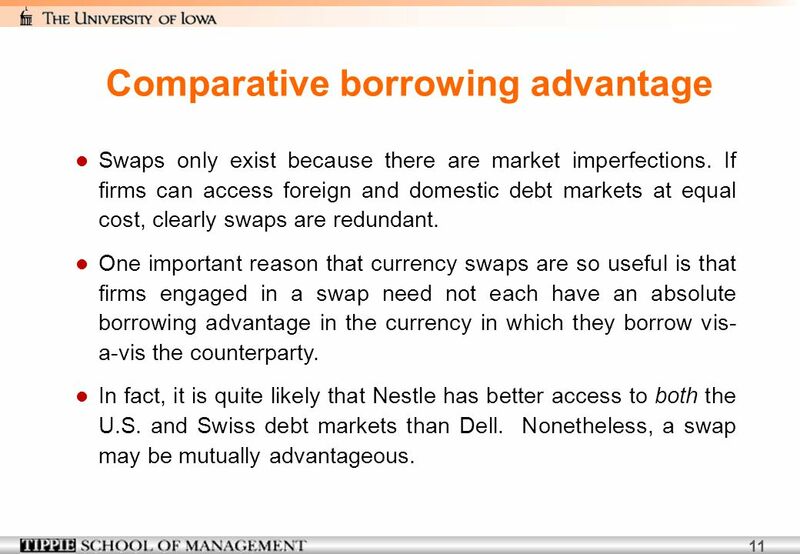 Swaps Transform assets or liabilities by “swapping” cash flows with another party Allows a party with a comparative advantage in a certain money market. 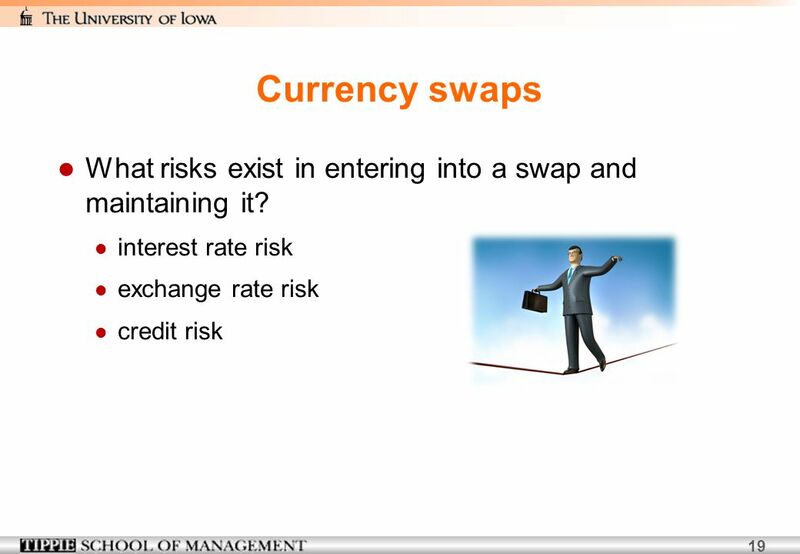 1 Currency and Interest Rate Swaps Chapter Objective: This chapter discusses currency and interest rate swaps, which are relatively new instruments for. Long-Term Financing 18 Chapter South-Western/Thomson Learning © 2003. 1 Admin News  Final’s date: 60% liked 12/18 (Registrar-set date).  => So, final will be 12/18.  Some of you had emergency reasons & wound not be able. 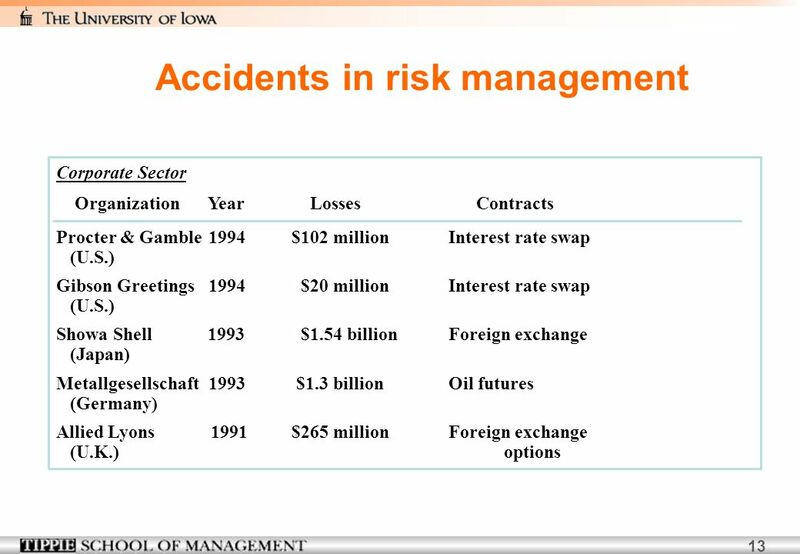 Copyright  2005 by Thomson Learning, Inc. Chapter 18 Managing Financial Risk with Derivatives Order Order Sale Payment Sent Cash Placed Received Received. 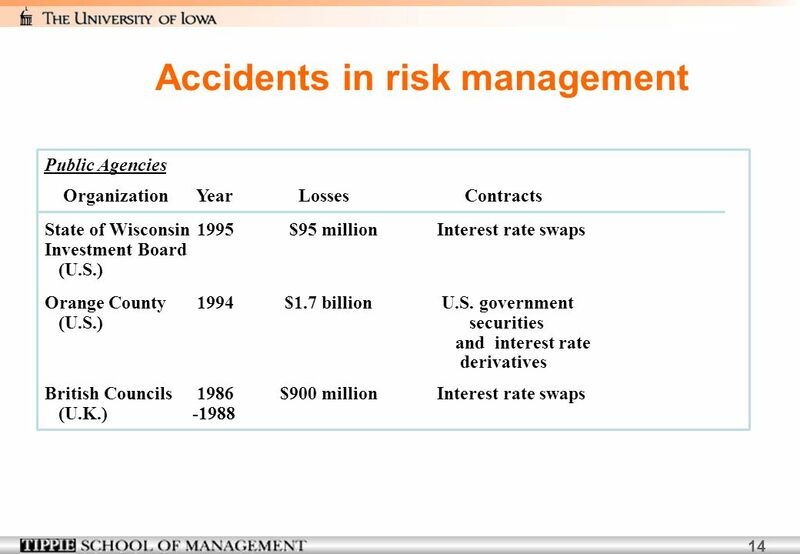 © 2004 South-Western Publishing 1 Chapter 13 Swaps and Interest Rate Options. Hedging Foreign Exchange Exposures. Hedging Strategies Recall that most firms (except for those involved in currency-trading) would prefer to hedge their. Welcome to class of International Financial Management by Dr. Satyendra Singh University of Winnipeg Canada. 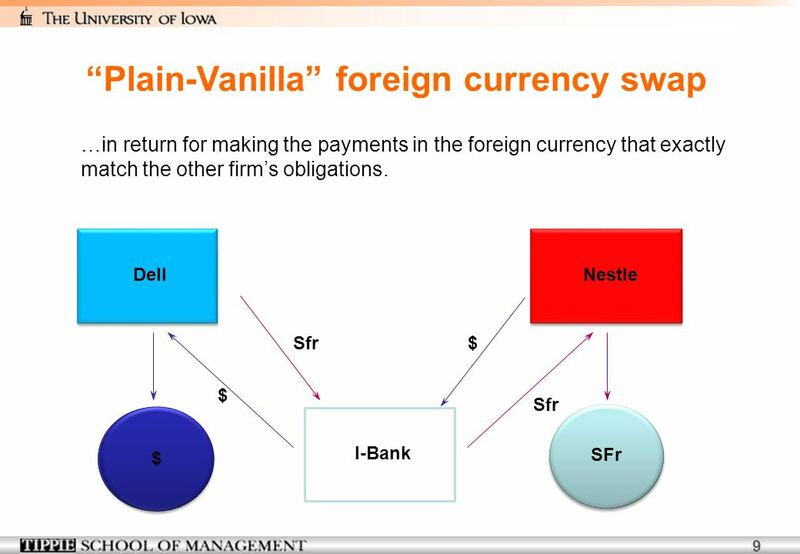 Foreign Exchange Exposure What is it and How it Affects the Multinational Firm? Swaps Professor Brooks BA /3/08. 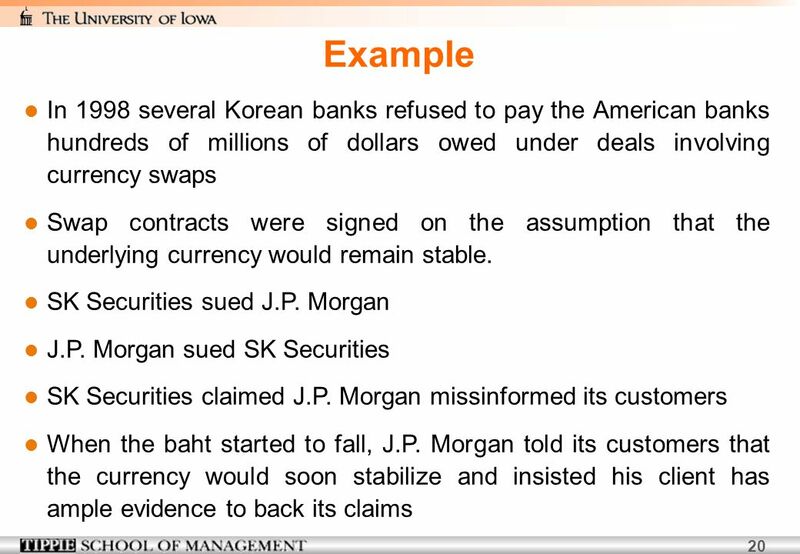 Chapter 13 – Swaps Back to Forward Contracts Individually designed forward contracts International Swaps and Derivatives. Interest Rate Risk. Interest Rate Risk: Income Side Interest Rate Risk – The risk to an institution's income resulting from adverse movements in interest. © 2002 South-Western Publishing 1 Chapter 14 Swap Pricing. 6-0 Finance 457 6 Chapter Six Swaps. 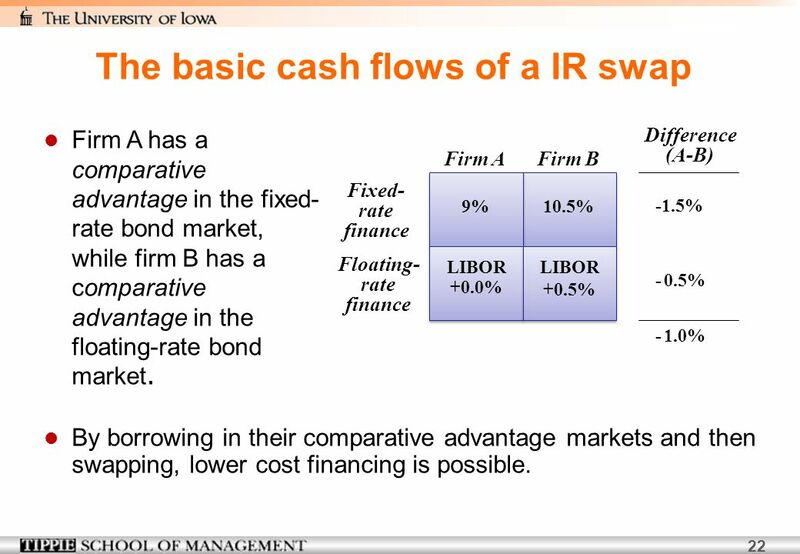 6-1 Finance 457 Chapter Outline 6.1 Mechanics of interest rate swaps 6.2 The comparative-advantage argument 6.3 Swap.